The hits arrived swiftly, recklessly, striking brains and causing damage. Not tackles on this Sunday’s NFL fields. Not this time. These were journalists contorting Aaron Hernandez’s diagnosis of chronic traumatic encephalopathy into arguments as twisted as the man himself. Messages like these only undermine the public’s grasp of the significant risks of playing tackle football. Rather than allow Hernandez’s diagnosis to take its proper place in the sport’s growing CTE picture, they merely arm those who want to downplay the issue—specifically the National Football League—with evidence of agenda- and agita-driven hysterics. However tempting it may be for some, blaming football for Hernandez’s longtime sociopathy—which culminated in murder and suicide—is even more foolish than futile. This goes beyond Hernandez’s neuroscientifically-challenged attorney, Jose Baez, who blustered to People that Hernandez’s young daughter is “growing up without a father because of the negligence of the NFL,” and that “CTE can explain a lot of his behavior.” It’s from people who should know better. Those who remember my more than 100 articles in the New York Times on football and brain trauma—the early cases of CTE, youth players imperiled by mishandled concussions, the NFL’s tobacco-industry-like research—might consider me the last person to try to temper response to news like Hernandez. Yet that work was driven by intolerance not for football, but for dangerous illogic—which this weekend cascaded from both sides. All this CTE-made-him-do-it business is distracting from the Hernandez case’s one vital, indisputable lesson: it is possible for 27-year-olds to have this level of significant brain atrophy. Perhaps the damage developed from his three seasons with the New England Patriots; maybe it started in his three college seasons at Florida; and, most frighteningly, it could have begun during high school or even youth football. It did not get there because Hernandez had a rough childhood, lost his father at 16, and ran with odious crowds. Nor was it swimming, a theory famously proposed to me once by one Dr. Goodell. There is no science, not even purchased by the NFL, that has connected CTE with anything other than repeated brain trauma. Claptrap like this drowns out how much those 110 positives do tell us about CTE’s prevalence. The cases of the BU group since 2008 (and dozens more presented by other researchers) are not drawn from the pool of all football players, or even just the 10,000-plus NFL veterans. Because CTE can be diagnosed only after death, the maximum denominator plummets to the 1,300 former players who have died since 2008 and could be examined in the first place. So even if every one of the 1,200 unexamined players had tested negative—the probability of this is roughly 1 divided by the number of atoms in the universe, but whatever—the bare minimum CTE prevalence remains at least 10 percent, spectacularly higher than in the general population. This shouldn’t be hard to understand. 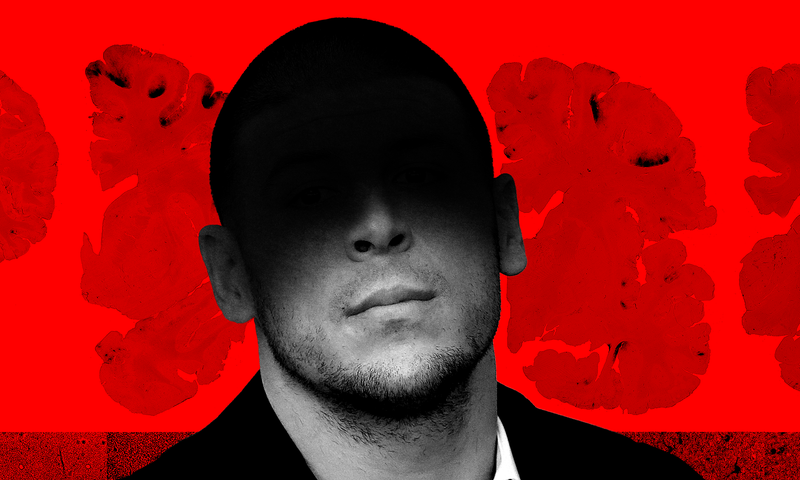 As we assert that many players develop problems because of CTE, intellectual honesty requires us to accept that some develop problems simply because they’re human—particularly in scenarios like that of Aaron Hernandez, an outlier if there ever was one. Nothing? Really? This spasm of stupidity would have been less infuriating had it not been co-opted by NFL spokesman Joe Lockhart in his nothing-to-see-here-folks conference call with reporters, and then quoted nationwide. The face of CTE is not just that of Aaron Hernandez or Frank Gifford. It forms only from hundreds of pixels—players like Andre Waters and Dave Duerson, who killed themselves; more placid but horrible early-dementia cases like Ralph Wenzel and John Mackey; college players like Owen Thomas and high school players like Nathan Stiles; hockey players like Bob Probert and soccer players like Patrick Grange; military veterans like David Collins; female soccer players who worry about their brain-trauma histories like Cindy Parlow, and NFL stars like Troy Aikman and Steve Young who do not. Doctors and deniers. Activists and obstructionists. The many players who will soon struggle with CTE, and the many players who will have no problems at all. It’s a mess. Our mess. And one that will never resolve on deadline. Alan Schwarz was an investigative reporter at the New York Times from 2007 to 2016; his work there, for which he was a finalist for the 2011 Pulitzer Prize for Public Service, exposed the NFL’s brain-injury crisis.